iDid: Automatic Navigation : iDid Inc.
iDid supports several automatic functions when it detects driving. One function is “Automatic Navigation/Driving Directions”. iDid uses several mechanisms to detect where you may be going and through a notification asks you if you would like to pull up navigation to that place. This option is useful to learn of traffic conditions even if you know the directions to wherever you are going. 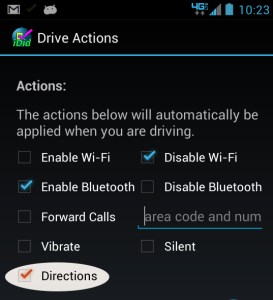 To turn on this function, check “Directions” in the “Drive Actions” Settings.